Here is the awaited second series of "We, the Ringobito." Having lived in the Tsugaru area and been involved in apples in various ways, they are the people to be handed down to the next generation. Here, their true stories are told. The second “Ringobito” is Mr. Tsuneo Kitae, the chairperson of Kitae Apple Co. Ltd., an apple trader. We are proud to present his story in two volumes. Please enjoy the first volume now. 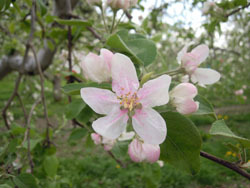 The artificial pollination and defloration process begins when apple flowers bloom. I’d like to show you how the defloration process goes following the previous process of “artificial pollination”. 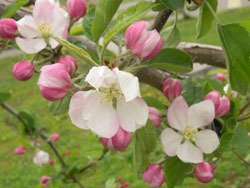 Apple flowers bloom in groups of 5 to 6 radially and the first blooming flower in the center is called the “central flower”, and the late-blooming surrounding flowers are called “side flowers”. Among them the central flower is saved and the rest are nipped off. If all the flowers bear fruit, each apple will not grow big or good. There are some cases in which all, including the central flower, are picked, judging on the tree branch. Severely selected flowers will grow with more nutrition and become bigger fruit. Also, the defloration helps to decrease the consumption of tree energy. That is to say, it suppresses the consumption of tree nutrition. You might think that it’s such a waste to pick beautiful flowers. However, it is important to produce good apples. 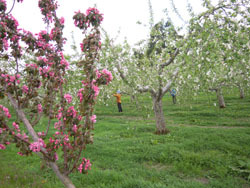 In the previous article, I showed an orchard with only the Fuji variety, which makes natural pollination difficult. 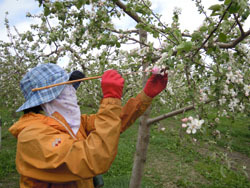 For this reason, I visited orchards with “Ourin” and “Hirosaki Fuji” varieties where they were using bees for pollination. 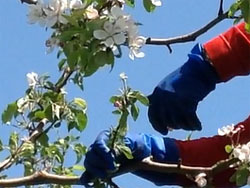 Owing to the characteristic of cross-pollination, an orchard with only one variety cannot manage the pollination only with bees. n the case of more than two varieties planted, bees fly over and collect other kinds of pollen to bear fruit. The bees flew lively around the wooden boxes containing bee tubes. 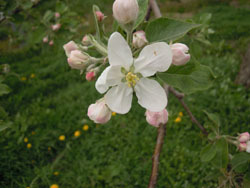 After completing the first step of apple growing - “pruning” in winter - flowers start to bloom as spring comes. Apples are ready to grow toward harvest time in autumn. 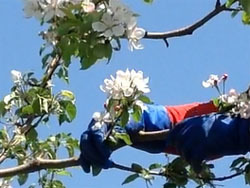 Farmers begin to pollinate flowers, and flower selection will follow. This time, I’d like to introduce the process of artificial pollination. Apples have the characteristic of “cross-pollination” in which they bear fruit only with other kinds of pollen, not by themselves. So, artificial pollination by humans and bees is necessary. 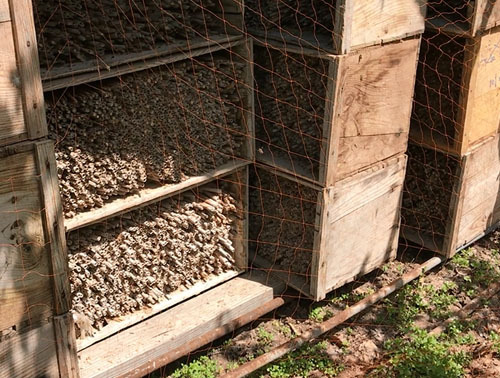 On a farm where natural breeding by wind or bees is difficult, it has to be done by hand. 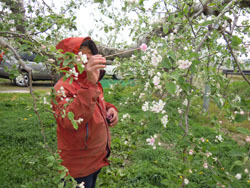 This familiar farmer, who is always kind enough to take us through the farming process, has an orchard of only the “Fuji” apple variety among the several farmlands. He planted some “May Pole” trees for breeding, and tried to pollinate with bees. But the natural breeding seemed difficult, and so he started working on artificial pollination. There are a few ways to artificially pollinate. One is a long stick with a cotton ball on the end, much like a q-tip, and each flower is pollinated by hand. Others use a big brush to spread over the whole branch. In that case, all the flowers on the branch would breed and it makes it hard to sort out the fruit later. So he uses the ancient method. Recently a method using a pesticide sprayer has been developed. Apple flowers bloom in a group of 5 to 6 radially, and the first flower in the center is called the “central flower” and the late-blooming surrounding flowers are called “side flowers.” The mixture of pollen and pink-colored filler for pollen is applied in the central flower. As you put a puff of pollen on each flower, the white flower turns to pink, letting you know that it’s done. After trying to use bees, this method became more effective. But apple producing takes time and labor like this.